So a while back, there was this recipe floating around Facebook. Everyone was sharing it and commenting on it. I prefer not to comment, I just prefer to cook it. And I did. 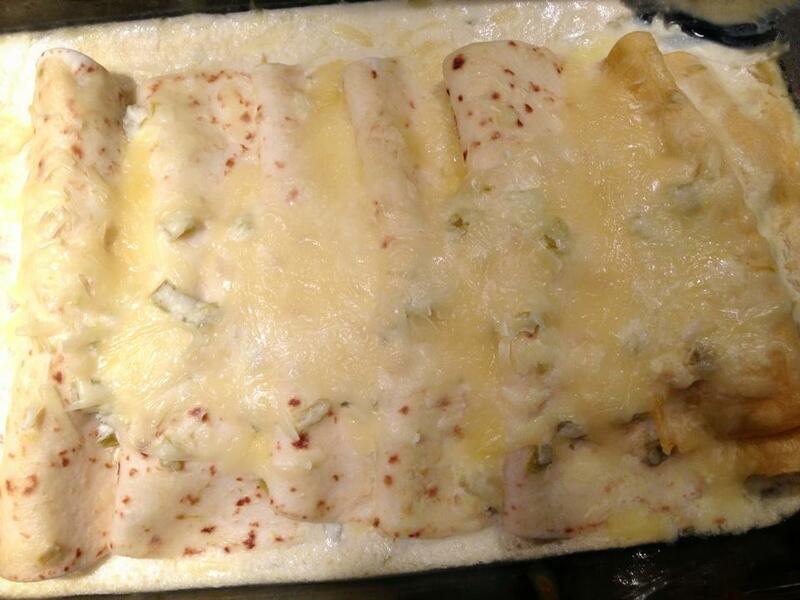 This is THE white chicken enchilada recipe to beat all white chicken enchilada recipes. They are so fabulous. They are so easy. That makes them Cajun mama style. If it is easy to yield delicious results, sign this girl up!!! I am pretty sure you feel the same way so I wanted to share. I have made them for several friends, and they all loved them just the same. My mother in law also loved them. And so did my father in law. That my dear friends, says it all. I am not saying that they are hard to please, but they are hard to impress. And they were impressed. Especially my one heck of a cook mother in law. She runs a lodge in Arkansas and she said she wanted to cook them for her hunters. That is all the compliment I need!!! These are really delicious and if you are craving Mexican but don’t feel like spending the money (for us it means taking 6 people to dinner…4 of them being kids!) or just don’t feel like going out…this is a definite alternative. So give them a try and let me know what you think! Preheat your oven to 350 degrees. Spray a 9 x 13 baking dish with cooking spray. Mix your shredded chicken and 1 cup of the cheese. Spread about 1/4 cup of the chicken/cheese mixture on each tortilla. Roll up and place seam side down in prepared baking dish. In a medium size saucepan, melt butter. Whisk in flour and cook for a minute. It will be quite think like peanut butter. That is what you want. Now whisk in broth slowly and stir with whisk until smooth. Continue to whisk over medium heat until thick and bubbly. Stir in sour cream and green chilies. You don’t want to bring mixture to a boil because it could scorch and stick and the sour cream could curdle. Nobody wants that. Pour thickened mixture over your pan of enchiladas. Top with remaining 1 cup of cheese. Bake for 20-25 minutes at 350 degrees and then switch broiler on hi and cook them for about 3 minutes or until cheese is good and bubbly and there is a little brown on the cheese. YUM!!!!!!! I serve this dish with cilantro lime rice you can find in the Mexican food aisle at Target. It is Archer Farms I believe. Also, if you love a side of beans, I use Frijoles Mexicana from Bush’s beans. It is a new line they have and they are in the bean aisle of many supermarkets. (kroger and Wal-mart carry them here). Hope you enjoy! Ole! Love it will try soon.